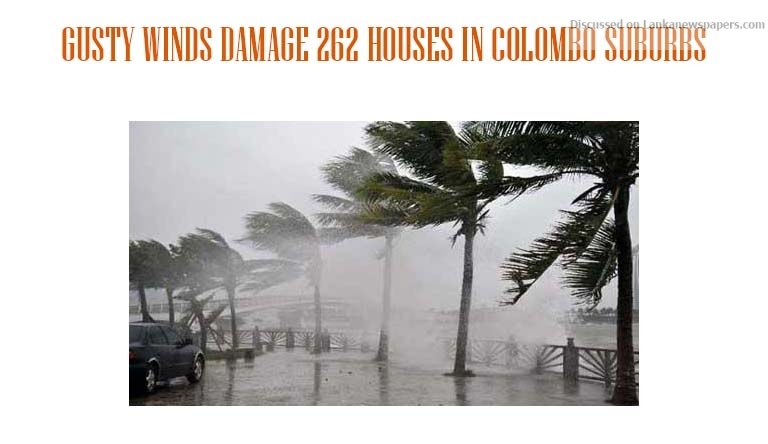 Around 262 houses had been partly damaged due to strong winds that prevailed across Colombo suburbs on Tuesday night. Disaster Management Center (DMC) Deputy Director Pradeep Kodippili said 117 houses in Homagama, 23 houses in Kesbewa, 4 in Padukka, 24 houses in Moratuwa, 70 in Ratmalana and 26 houses in Dehiwala had been partially damaged. “A total of 849 persons in 263 families had been affected due to strong winds that prevailed in the Colombo suburbs,” he said. Meteorology Department Duty Forecaster Nimal Bandara said that the country is still experiencing the South West Monsoon and heavy showers and strong winds are common features of the South West Monsoon. “The possibility for increasing wind speed is still high in the sea areas around the country and it will also continue further in the next few days,” he said. The Meteorology Department said showers will occur at times in the sea areas extending from Puttalam to Matara via Colombo and Galle. The sea areas extending from Puttalam to Trincomalee via Kankasanturai and also in Hambanthota to Kalmunai via Pottuvil can be very rough at times as the wind speed can increase up to 60 to 65 kmph at times. Other sea areas can be rough at times as the wind speed can increase up to 50 to 55 kmph at times. Naval and fishing communities are requested to be vigilant in this regards.